Last Friday, during a call with my client, I received a notification from Paypal that I sent a payment to certain Michael Theron amounting to $25. I tried my best to recall if I have purchased anything from the company stated on the notification. But I am not even familiar with the company’s name. After my client’s call, I logon to my Paypal’s account and tried to file a transaction dispute. But I probably didn’t make it right so when I came back in the afternoon, I logon again to my Paypal account to check if there was any progress on the dispute I filed. But there was no transaction recorded under the Resolution Center Cases. So I filed again and made sure that the report would appear as an Open Case. Paypal promised to return the fund if the case is decided on my favor and I believed it should. Until now the case has not yet been resolved. Upon checking the transaction dispute history log, Paypal had emailed the seller twice, once last September 25 and another email was sent last September 28. But I still wonder how this happened. 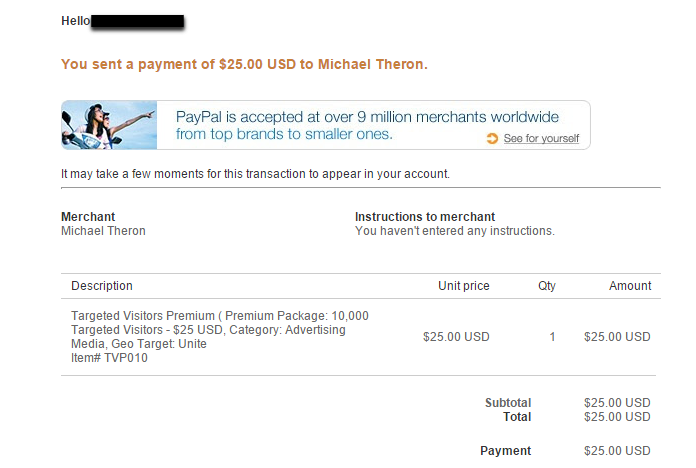 Was my account hacked and the hacker sent the payment to this Michael Theron? If not, is it a Paypal system’s glitch? Have you experienced this concern? Did you get the refund from Paypal? Nakaka-alarm naman ‘to sis. Sana marefund mo pa ‘yung pera. Si Chris (mommyjourney) din ata na hack ang paypal nya nabasa ko lang sa blogpost.